The "extraordinarily informed" account of how US cryptographers broke Japan's Purple cipher to change the course of World War II (Kirkus Reviews, starred review). 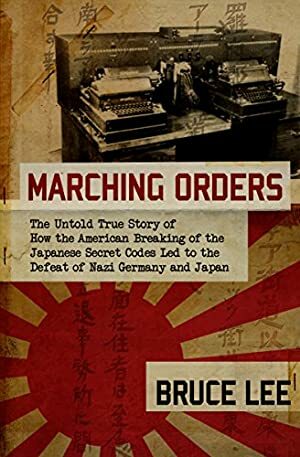 Marching Orders tells the story of how the American military's breaking of the Japanese diplomatic Purple codes during World War II led to the defeat of Nazi Germany and hastened the end of the devastating conflict. With unprecedented access to over one million pages of US Army documents and thousands of pages of top-secret messages dispatched to Tokyo from the Japanese embassy in Berlin, author Bruce Lee offers a series of fascinating revelations about pivotal moments in the war. Challenging conventional wisdom, Marching Orders demonstrates how an American invasion of Japan would have resulted in massive casualties for both forces. Lee presents a thrilling day-by-day chronicle of the difficult choices faced by the American military brain trust and how, aware of Japan's adamant refusal to surrender, the United States made the fateful decision to drop nuclear bombs on Hiroshima and Nagasaki. Hailed as "one of the most important books ever published on World War II" by Robert T. Crowley, an intelligence officer who later became a senior executive at the CIA, Marching Orders unveils the untold stories behind some of the Second World War's most critical events, bringing them to vivid life. With this book, "many of the mysteries that have eluded historians since the end of the war are much clarified: the Pearl Harbor fiasco, D-Day, why the Americans let the Russians capture Berlin, and why the decision to drop the atomic bomb was made. This is the most significant publication about World War II since the recent series of books on the Ultra revelations" (Library Journal). It's a story that, as historian Robin W. Winks said, "no one with the slightest interest in World War II or in the origins of the Cold War can afford to ignore." We started tracking this book on June 22, 2015. The price of this book has changed 85 times in the past 1,399 days. The lowest price to date was $0.99 last reached on August 25, 2017. The highest price to date was $14.99 last reached on June 22, 2015.